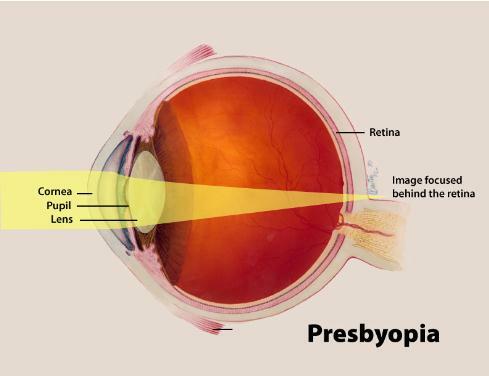 Presbyopia is a natural occurrence where near vision becomes blurred, making it hard to focus while doing things like reading, using a mobile phone, or working on the computer. It is not a disease or illness; in fact, it is very common with age. People commonly mistake the symptoms of presbyopia for longsightedness. However, the two conditions have different causes: longsightedness is a result of a misshapen cornea, whereas presbyopia is due to the loss of flexibility in the lens. The telltale symptom of presbyopia is blurred vision while reading, sewing, using a mobile phone, or doing anything that requires near vision. There are many options for people with presbyopia, including contact lenses. Recent technologies allow people who are entering into presbyopia to continue wearing contact lenses, instead of having to switch to bifocals, or reading glasses. Contact lenses: Bausch + Lomb SofLens Multi-Focal contact lenses let your eyes focus naturally, effortlessly – at all distances. These lenses feature a gradual design that eases the transitions eyes have to make from near to far distance. Talk to your eye care professional to see if SofLens Multi-Focal contact lenses are right for you. Crystalens is an artificial lens implant that, unlike a standard Intra Ocular Lens, can treat both a person's cataracts and presbyopia—loss of near and intermediate vision. Crystalens not only treats your cataracts (a clouding or hardening of your lens); many patients hardly if ever wear glasses after surgery. It does so by recreating accommodation similar to your eye's natural lens. The unique Crystalens is designed to allow you to enjoy a fuller, more natural range of vision for most activities, including: reading a book, working on the computer, and driving a car.